One of the more interesting concentrations of placer gold can be found along the southern coast of Oregon, where very fine particles of gold and platinum can be found amongst in the beach sands. These gold deposits were first discovered in 1852, not long after the discovery of a very significant gold district in Southwest Oregon. For a few years after their initial discovery, the beaches were highly productive, and small recovery has occurred since that time. The source of this gold is somewhat due to these inland deposits, as well as the ground that has been eroded by wave action directly adjacent to the beach. 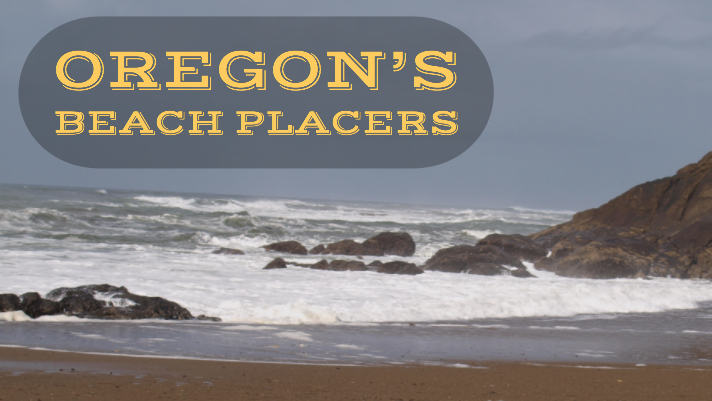 The beach placers of Oregon are similar to the famous beach gold deposits of Nome, Alaska. Like all placer gold deposits, the concentrations of gold are not evenly distributed. Some stretches of beach were exceptionally productive, while others hold only trace amounts of fine gold. The majority of the richest beaches are found adjacent to the Klamath Mountains, just south of Coos Bay. The gold recovered is almost always very finely textured, and found in relation to black sand deposits. Wave action has a huge influence on locations of black sand deposits, and due to the extremely fine texture they are easily transported by the action of the tides. Successful prospectors look for stringers of black sand that can range from a few feet to several hundred feet in length. New deposits can be quickly transported, and a paystreak can easily disappear with the action of the waves. Ancient beaches adjacent to the current seashore at approximately 170 feet elevation were also quite productive when originally discovered a few decades after the initial beach placers were found. The gold and black sand paystreaks are generally found at 20 to 60 foot depths, covered with sand overburden. Many of these placers have been mined, with several commercial operations working along the Southern Oregon Coast for many years during the 1800’s, and again with renewed interest during the depression years of the 1930’s. It is mostly believed that the richer deposits have been exploited. Profitability of working these ancient bench deposits is highly dependent on the amount of sand overburden and richness of the paystreak. Because of this, most recreational beach prospectors seek out gold deposits closer to the current seashore. Inconsistency of gold deposits limits the size of most current prospecting endeavors, but certain areas are still more consistent producers than others. The beaches near Whiskey Run, Cape Blanco, Port Orford, south to the mouth of the Rogue River are all areas that will still produce gold and platinum. Prospecting the beaches of Southern Oregon can be especially challenging, and using methods of fine gold recovery are critical to retaining the extra fine particles of gold and platinum. The largest particle size a prospector will typically encounter is less than 1 millimeter, but the vast majority is much smaller ranging down to micron particles nearly invisible the human eye. The placer gold deposits along the beaches of Southern Oregon have not been productive enough to warrant much attention on any commercial scale for nearly 100 years, but small scale prospectors still explore the area every year in search of gold. The sporadic deposition and fine particle size make an exceptional challenge that many local prospectors enjoy. Occasionally, rich pockets of black sands are uncovered and good gold concentrations can still be found today. The beach placers of Southern Oregon provide a fun and unique gold prospecting opportunity. Be sure to give it a try if you are ever in the area.